The much awaited Ateneo College Entrance Test (ACET) for school year 2015-2016 is now available online for viewing in the official online portal of the Ateneo de Manila University (AdMU). The entrance test list of passers can now be viewed in the website of the Ateneo de Manila University. You can also view the printed poster at the AdMU Blue Eagle Gym. ACET has multiple-choice questions and essay questions in English, and covers several areas of study such as Mathematics, English and General Intelligence. If you're the high school student who took the exam, you can now search their names in the results database provided by Ateneo on their official website. To search your entrance test result, just fill up the form in their website. 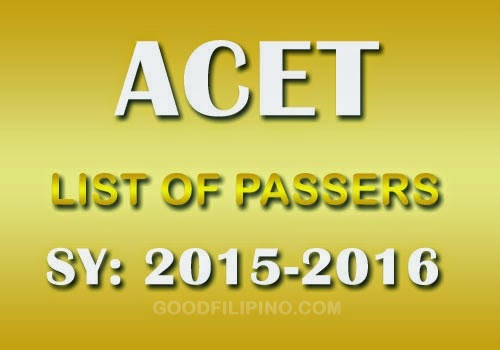 For more information about Ateneo College Entrance Test (ACET) 2015, kindly save the given link and share to your joined social networking sites. Comments or suggestions about "ACET SY 2015 to 2016 Results Released" is important to us, you may share it by using the comment box below.